After working all day at their respective jobs, professionals enter the classrooms and have their seats at Yunus Emre Institute at the end of their working hours. As the classroom doors are closed, the students leave their mother tongue, English, outside and set off on the adventure of learning Turkish. 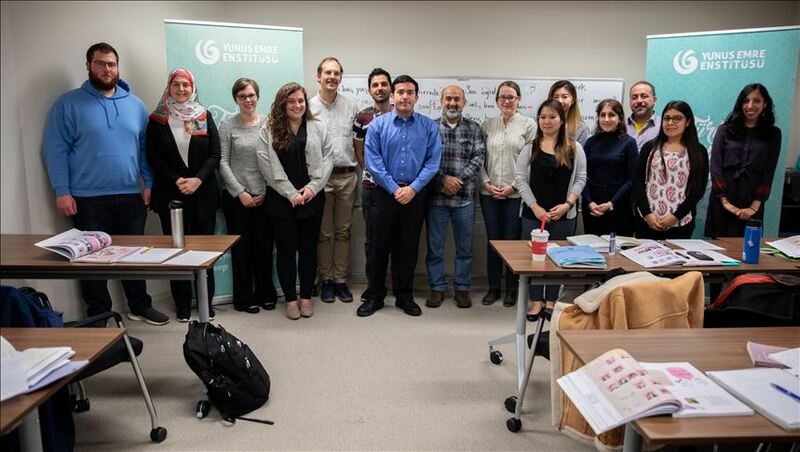 Hüseyin Aydın, a teacher at the Turkish language course given by the Washington center of Yunus Emre Institute, which seeks to promote Turkish language and culture around the world, stress the importance of speaking Turkish throughout the lesson. If a student utters a word or two in English, he pretends not to know any English. Bo Knutson attends the beginner level course and he says that what he likes about Yunus Emre Institute's Turkish language course the most is that only the language being studied is used during the course and this makes it easier to learn the language. Knutson works at a public organization which sends US students to different countries to study and vice versa. He notes that they currently work on a Turkish program and, therefore, he seeks to advance his Turkish proficiency. Natalie Tan works at an international organization in Washington and she indicates that she wants to have some knowledge of Turkish at least at the basic level before going to Istanbul next month. Tan has been attending the Turkish language courses for three months. "The courses I have taken so far have made me believe that Turkish is a very interesting language. My aim is to have an idea about the structure and logic of the language," she said. Yunus Emre Institute's Washington DC Branch Director Halid Bulut said: "People from all age groups and professions attend our courses. These courses are not only courses teaching a language, but also they offer an opportunity to promote Turkish culture, traditions and values."